Shelving Inc. just recently completed a locker room installation for a local middle school locker room. 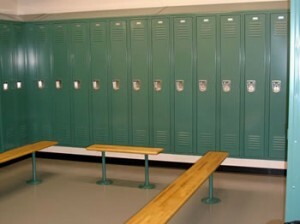 The school was in need of durable metal lockers for their students to safely store their clothing, and belongings in. The lockers rooms also needed sturdy locker room benches for seating, so Shelving Inc. was more than willing to lend a hand and complete a speedy installation. Installed where steel lockers 12″w x 18″d x 72″h with continuous sloped hoods, recessed stainless steel handles, with hard rock maple benches and steel pedestals to match the color of the lockers. Installation was completed over a weekend so the school could have use of the locker room on Monday morning. The sloped hoods we installed will keep a clean appearance in the locker room and prevent students from storing things on top of the lockers. The slopes provide easy maintenance too as less dust collects when using sloped hoods and cleaning is a breeze. The end result was a stylish shiny new locker room ready to withstand years and years of student use! This is Useful. Much Appreciated.